On November 1, 2013, TSA agent Gerardo Hernandez was killed and six other people were injured when a gunman opened fire in Terminal 3 at LAX. We just passed the fourth anniversary of that tragic day, and threats to airports only continue to grow. LAX has undergone big leadership changes since the shooting, with a new CEO and a new police chief. They have not been tested like their predecessors. When they are, let’s hope they do better — and all indications are that they will. The years following the LAX shooting have been marked by a series of terrorist attacks on transportation hubs, including the airports in Istanbul and Brussels in 2016, and Paris in March of this year. Just a few weeks ago, the acting secretary of the Department of Homeland Security warned that ISIS and other terrorist organizations seek to bring down aircraft to cause large numbers of civilian casualties. Meanwhile, recent events such as last month’s Las Vegas shooting and the New York City truck attack underscore that areas where large groups gather continue to be targets for violent individuals. We have also seen an increase in ambush attacks targeting law enforcement officers, from Dallas to Baton Rouge to New York and beyond. A continued pattern of violent incidents has also plagued our nation’s airports. These include the March 2015 machete attack at a TSA checkpoint in New Orleans; the January 2017 shooting at the Fort Lauderdale Airport that killed five people and injured six; and the June 2017 stabbing of an airport police officer at Bishop International Airport in Michigan; and most recently, on November 2, the arrest of an armed man suspected of planning to shoot his wife at the Orlando Airport. In 2016, the TSA confiscated 3,391 guns from carry-on bags, 83% of which were loaded; nearly that many (3,053, to be exact) had already been seized by October 10 this year, suggesting that 2017 totals will be at a record high. This past summer also saw the busiest travel season ever for airports, with 239 million passengers screened, and 2017 has already seen four of the 10 busiest travel days of all time. All of these factors underscore that airports continue to be a “holy grail” for killers who want to inflict mass bloodshed and terrorists who want to make a statement against the United States. 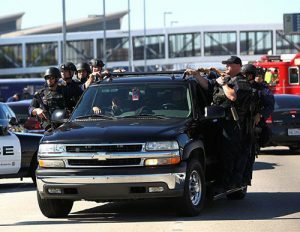 So, now is a good time to look back on the LAX shooting, see where we are today and assess whether changes have been made that would prevent an attacker from shooting their way through security screening and gaining access to a plane at America’s second-busiest airport. Among the questions: What has LAX done to address the calamity of errors that gave the 2013 gunman the ability to shoot through TSA clearance and enter the gate area? What has LAX done to ensure that massive chaos would not evolve during a major incident like the last one — where three incident command posts were established and contradictory directions were given to passengers and employees? When the shooter walked into Virgin America’s Terminal 3 check-in area that Friday morning, he had the appearance of any other hurried traveler. He packed differently, however, cutting a hole in the bottom of a duffel bag and the top of a roller bag that he stacked so he could conceal his rifle and for quick access. He took out the gun and shot a TSA agent at the bottom of the escalators leading up to the TSA screening checkpoint. He walked up the escalator and, upon looking back and seeing that the victim was still moving, walked back down the up escalator, stood over the TSA agent lying on the floor and shot him multiple more times. He continued his terror-filled walk (he never ran) up the escalator and through TSA screening, asking “Are you TSA?” and shooting in the general direction of anyone wearing what appeared to be a blue TSA uniform. He strolled through TSA detectors and X-ray. He passed benches and bathrooms, and walked a short, stark hallway that led to the floor-to-ceiling windows and an active gate (without an idling plane at that moment). He continued past multiple concessions stands and stores, all the way back to the main circular gate area at the rear of the terminal — where airport police shot him decisively and definitively in front of the fast-food restaurants that lined the walls. It is how he got that far that is troubling. The events of that day exposed a number of communication and coordination problems that hampered the response, as detailed in the after-action report commissioned by airport management. When the attacker shot the first TSA agent, his comrades engaged. TSA agents at security screening pressed the TSA panic buttons — alarms encased at the screening area exactly for this purpose — but they didn’t work. Another TSA agent picked up a hard line “red phone” to report the shooting. He left the phone dangling from its cord as the shooter advanced. There was no caller ID, so police dispatch did not know where the perpetrator was in the massive airport. TSA agents, travelers and employees dialed 9-1-1 from their cell phones and airport phones, but none went to LAXPD dispatch (they are routed to CHP and LAPD). TSA did what they were supposed to do, and their systems failed them. The series of mishaps led to unnecessary delays for airport police in apprehending the shooter. Then, as the assailant made his way past TSA clearance and down those airport hallways, there were no cameras to follow him. Once LAXPD determined that the shooter was in Terminal 3, they had no eyes to track him in real time. There was no way to know if the shooter was lying in wait — in a bathroom or around a corner — to ambush them. In 2012, LAXPD’s training division and Emergency Services Unit (ESU) brought back our Department-wide active-shooter training, which had not been prioritized in prior years; we now continue this training annually. It is indisputable that the training is invaluable. When called upon to act, Los Angeles Airport Police were decisive and brought a definitive end to the 2013 rampage, apprehending the gunman, rendering aid to the wounded and saving countless lives in the process. “November 1 will always be a day of reflection at LAX,” says LAAPOA President Marshall McClain. “For me, I appreciate the work our officers did in textbook fashion to take down the shooter. Even with all the impediments along the way, we did our jobs, and it is important that all the officers working that day and those directly involved are remembered, including Sergeant Steve Zouzounis and Officers David Lalicker, Brian Lopez, Robert Pedregon, Raymond Woods and Daniel Yu, along with everyone else who leaned in. And, of course, condolences are still fresh for TSA agent Gerardo Hernandez’s family and all of those who were injured.